I made a new door decoration With some RED for the Fall season. My hat with the yellow daffodils and ribbon will be put away for next year. This is a door knob hanger that I though was cute! Have fun visiting other participants. And please sign Mr. Linky and leave a comment. Both of those are adorable! Your door decoration is amazing! Just beautiful. I am so impressed with your creativity. I love your door decoration and wish I was as creative. Aren't you the creative one? Very nice door decor! Wow, that makes a welcoming door. I remember the hat and I liked it a lot; but this is beautiful! It's lush with all the right fall colors. The berries and leaves were just the right addition. Mr. Scarecrow is pretty cute! A lovely selection of Autumn colours in your arrangement. I love Fall and all the great decor that comes with fall! 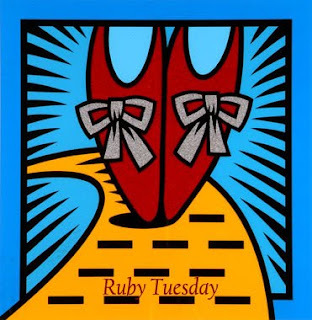 Happy Ruby Tuesday Mary! How cheerful! I have decorations in my post this week, too. I love your dried flowers. Mary thanks for hosting, and I love your photos. This week, it's feeling like fall, here, but it's suppose to heat up, again, by the weekend! Love your decorations! One thing we don't get down here in Florida is a proper Fall. Sometimes I miss it, but the feeling passes quickly, LOL! Love the flowers Mary. Very artistic, and so Fall like. Like the door decoration too. I must get my Autumn decorations out. I have some decorative guys on my post this time! The door knob is looking adorable indeed.It looks hand-made :) Creative handicraft. Very pretty door decoration, and the knob hanger is definitely cute! Love both photos! Very creative of you, too. What perfect shots for fall! 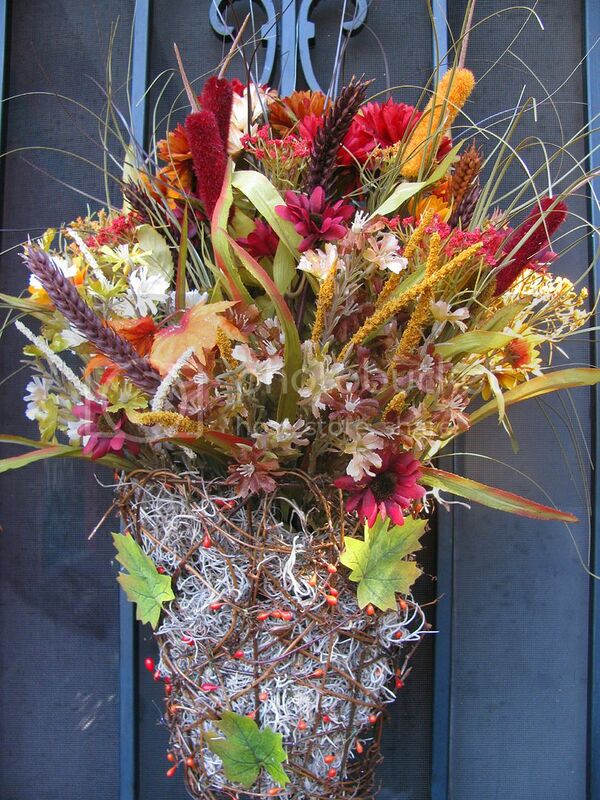 your autumn bouquet is just overflowing with the richly colors and flowers of this season. The horn of plenty makes us forget that frosty king winter is knocking at the door. Like the knob hanger; let's keep smiling. I'm going to bed now, it' four in the morning. I just had to sacrifice some beauty sleep to join in on Ruby Tuesday. Love the door decoration; very attractive! Cute scarecrow, too. I love your beautiful door decoration. The knob hanger is so cute! It's that time: let the decorations begin! You look like you are having tons of fun. I'm still picking tomatoes, amazingly. Love both decorations, but the door hanger is really cute ! I love that flower arrangement, so lively! And love your template too!! good morning beloved teach...it IS morning here in southern ontario..it is 2:30 a.m.
but i just had to say hi anyway. i hope you don't mind that i used those ruby dancing shoes again. i love them so. i really like your arrangements here and i especially like the little maple leaf buttoned on to the green hat. that little face is way too cute mary t..
what a lovely flower arrangement. a great entry for Red Ruby. I really like your decorations. wonderful job. Oh it's very pretty. I might just have to get something for my front door as well. My R T is now posted...a bit on the eerie side of the yard this time. Looks like Fall!! I love door decorations. I so love the new look, Mary! How festive and creative, joyful and beautiful. What a beautiful door decoration. You wanna come to my house and make me one??? LOL. I love the colors of fall. Very nice job on your decorations. I'm late but I'm here! I love your dried flower door decoration. And the scarecrow is adorable. Wow Mary you made that? very pretty. I have one on my door but I bought it, I am not that creative. 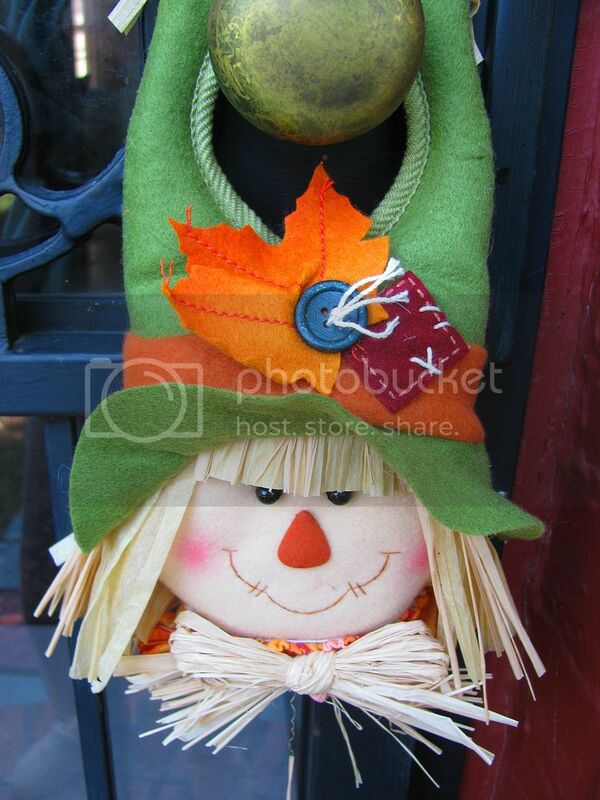 The door hanger is very cute also, great for the fall mood. Oh I love that basket! It is beautiful. And I am a sucker for anything scarecrow that has appliques! I'm glad you liked the special Halloween TREAT!!! Happy day, once again to you. thanks for this very wonderful meme Maryt..love your photos here! The dazzle of colours is amazing on both items! Beautiful! I like how you've taken the time to "do up" your front door. I stopped by your blog to verify that you were still hosting your Tuesday "theme day". I love everything about autumn, especially the colors. Nice touches of red in these photos! Thanks for your comment on my red shed. The homes on that short street are old and ell maintained. I was stopped for traffic and just took a quick shot before moving on. I took a lot of photos of red on Sunday - will be posting some next week. You are so talented. That floral piece is just gorgeous. Just beautiful. I am so impressed with your creativity.